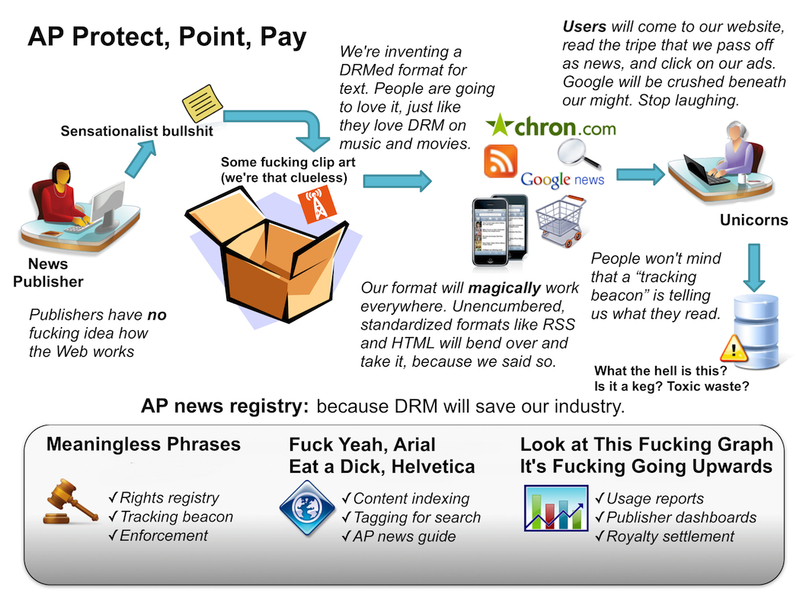 A lot of copyfighters were mystified by the Associated Press's recent announcement (complete with a bonkers diagram straight off a bottle of Dr. Bronner's) that they had spent millions of dollars on a DRM system for news that would limit how you could paste the text you copied from your browser window. This is a seeming impossibility, and while there will always be DRM vendors with impossible magic beans to sell to any panicked goofball media dinosaur who'll buy them, it just seemed too weird to think that no one at the AP had said, "Wait, what? This is dumb." Now Ed Felten has delved into the details that can be gleaned about these magic beans and concludes that AP has made up a bunch of fictional things that their reasonably neat content-management system and microformat can do. Unfortunately for AP, the hNews spec bears little resemblance to AP's claims about it. hNews is a handy way of annotating news stories with information about the author, dateline, and so on. But it doesn't "encapsulate" anything in a "wrapper", nor does it do much of anything to facilitate metering, monitoring, or paywalls. AP also says that hNews " includes a digital permissions framework that lets publishers specify how their content is to be used online". This may sound like a restrictive DRM scheme, aimed at clawing back the rights copyright grants to users. But read the fine print. hNews does include a "rights" field that can be attached to an article, but the rights field uses ccREL, the Creative Commons Rights Expression Language, whose definition states unequivocally that it does not limit users' rights already granted by copyright and can only convey further rights to the user.